When the model turns, the 3-wheel chassis "leans" into the corner much like their full-size counterparts. The 3-wheel chassis features the motor in the rear section, with the battery in the front. The two sections are linked in the middle, and a steering servo leans the entire front section left and right to effect turns. Own your very own remote controlled version of a supercar with this brilliant and detailed replica of the iconic Bugatti Chiron supercar. Race it around the streets or roudn your house easily and watch how it zooms speedily with expert control. General Information: Features forward and reverse drive and left and right steering. One supplied. Size H5.8, W18.5, L8.4cm. Batteries required: 5 x AA. For ages 3 years and over. WARNING(S): Not suitable for children under 3 years old. Only for domestic use. We opened the box only to check condition and test that it works. All as seen in photos. 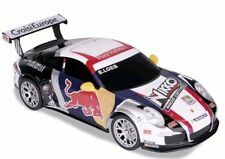 Requires 3 AA batteries for the vehicle and 2 AA batteries for the R/C unit;not included. 5435759 E0181. Get your hands on this 1:16 scale Mclaren p1 supercar. For ages 6 years and over. Batteries required: 7 x AA (not included). Size H8, W29, L14.3cm. One supplied. Iconic launch colour. DIE-CUT ABS HATCH TO SEAL THE DECK OPENING. New, sealed in the box. DETAILED BUILDING INSTRUCTIONS. CENTRAL SHROUDTENSIONING SYSTEM. BALLAST WEGHT 2,1 kgs. Tamiya VW Volkswagen Golf Mk.1 body only as Shown. HG P402 1/10 2.4G 4WD (Four Wheel Drive) RC Jeep ACCESSORIES INCLUDED . Battery: 7.4v 1500-mAH lithium battery. Weight: 3.9kg. 1 × RC Car. Car Size: 49×24.5×26cm(L W H). Speed: About 20 km/h. Product Color: Silvery. HG P601 1/10 2.4G 6WD (Six Wheels) RC Jeep ACCESSORIES INCLUDED . 1x HG P601 Climbing Car. RC distance: ≥100. RC battery: 4x 1.5V AA battery(not included). motor:540 High Power Brush Motors. governor:40A electronics stepless speed regulator. This is a detailed 1:16 scale model of the truly iconic LA Ferrari supercar. Impress your friends as this may be the closest you get to the real thing. Great for the desk or to get back to your childhood. It can take photos and videos which are sent directly to your phone through bluetooth. - the quadcopter;. - the battery (500 mAh);. Tamiya Volkswagen Golf Mk.1 Racing Group 2 M05 1:10 1:12 Radio Control car kit. Th RC M05 (1:10. This is the Tamiya 1:12. The M-05 is a simple to build FWD (front wheel drive) machine, which allows for plenty of after-market and hop up parts to be outfitted as you grow with your skill. ). FERRARI 458 ITALIA 1: 14 SCALE RC MODEL CAR TOY. FERRARI 458 ITALIA 1: 14 SCALE RC MODEL CAR. § Functions: forward, reverse, turn left, and turn right. § Battery operated, continuous fun for 1-1.5 hrs. # Truck with prepainted body shell. ( body style supplied is as per pics # 4 and 5. # shaft driven 4 wheel drive with slipper clutch. Needed to run- 4 x AA batts (transmitter) and 7.2/7.4 VDC battery for the car. ). New Helion Avenge Mt XLR Gray Shell for The Truck. Model Helion Avenge Mt XLR. Scale 1:10. Product Line Basher Truck Level. Type Truck. Material Plastic. Fuel Type None. Blades for Contixo F5 drone w/screws. Color Black. Fuel Type None. Country/Region of Manufacture China. KID GALAXY MY FIRST R/C. Easy to use 2 button remote. Spin N Go action: 1 button to go straight and one to spin. chunky style is perfect for little hands. •1 x Potensic Quadcopter. When the drone battery is low, then the transmitter will sound beep alarm and remind you to fly back the drone as soon as possible. To avoid lost and get rid of concerns. When flying you no need to distinguish the direction under heading hold mode. Model: WLtoys 24438. - 1:24 scale original proportion: Accurate to every detail of the racing car, which making it much more real! - Transmission ratio: 1:133. - Adopt high-quality PVC material, and good scratch resistance in characters. Lightweight plastic body allows precision steering and fast racing on level surfaces. The sports car has a lightweight plastic body which allows it to reach respectable speeds on level surfaces. Authentic features incredibly detailed version of a truly impressive car. Own one of the world's most desirable cars with this scale Lamborghini Super Leggera. With a full direction remote this stylish car is ideal for kids, adults and collectors alike. For ages 6 years and over. Lamborghini Super Leggera Radio Controlled Car Yellow RRP 12.99 lot GD. Condition is Used. Dispatched with Royal Mail 2nd Class. RB Racing Engine Selection Of Small Parts No piston conrod backplate or head No returns. No partial refunds. Anki Overdrive Guardian Expansion Car. Anki OVERDRIVE Starter Kit required to race. Each player must have a compatible iOS or Android Device. Anki OVERDRIVE Expansion Car Guardian. It's effortless by design. Get on the Piston cup racing circuit and help the legendary Lightning McQueen defeat his new rival Jackson storm with your very own McQueen race car! Safety Warning. width: 0 x height: 0 x length: 0 x weight: 0. Item model number: 54650. With rotatable limbs it walks forwards and backwards with a realistic style and also has a mouth that can open and close too. Makes realistic sounds and actions and LED light up eyes this will scare as well as amuse.